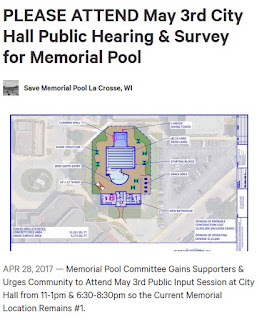 4/28/2017 - PRESS – FOR IMMEDIATE RELEASE LA CROSSE, WI – Grandview-Emerson Neighborhood Association (GENA) and the Memorial Pool Committee continues its efforts to revitalize Veterans Memorial Municipal Pool after almost 2 years of closure. Plans to replace the pool, which 7 out of 10 city-wide residents favored in a survey administered by UWL last summer, continues to grow support. Letters of support by the community and additional committee members from other neighborhoods have joined the effort to revitalize the pool that serves the central and downtown areas of the City. Now that the City Pool Committee has completed over six months of deliberation, five concepts remain - 2 of which are located on the current Memorial Pool property. Wednesday, May 3rd is an opportunity to settle the debate, once and for all, as to whether the current site not only is the most feasible, but the most favored by residents. The City Pool Committee is inviting residents to come for a short presentation at 11am or 6:30pm. Following the presentations, residents are welcome to meet with City staff, Committee members and a Burbach Aquatics consultant for the following 2 hours, for further questions and discussion while viewing the concepts on large story boards. Surveys will be available to gather information that will be included in the final report by Burbach Aquatics and presented to the Park Board and City Council. “It’s not the City’s job to work hard for feedback, it’s our job. So everyone needs to put time aside on Wednesday and then put some pencil to paper to tell the City Council what they think. This could be the final chance.” states Dennis Ross, a nearby resident and retired Blessed Sacrament school teacher.